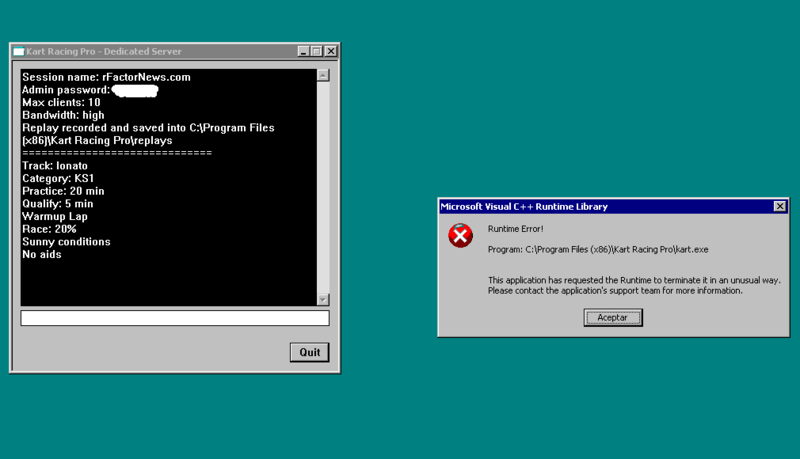 NOTE: if a client runs on the same PC, port 54410 cannot be used. Configuration file must be in installation path. If not set SERVER.INI is used. MOTD = ; message of the day. Use "/r" to split the message in multiple lines. pause = ; 0 or 1. If set to 1, the event is paused and saved at the end of "pause_session"
pause_directory = ; the directory where data is saved. The default is "resume"
save_directory = ; the directory where data is saved. The default is "resume"
The server will move to the next at each restart and wrap to the first after the last. The same track and layout can be repeated multiple times in the 10 "slots". The GUID can be read in the "Profiles" page. In the dedicated server text input, it is possible to type text that will be sent to the connected clients. NOTE: a license is not needed to start a dedicated server. How do you launch it with different params? One question, I create a server.ini? When I create the i.e. 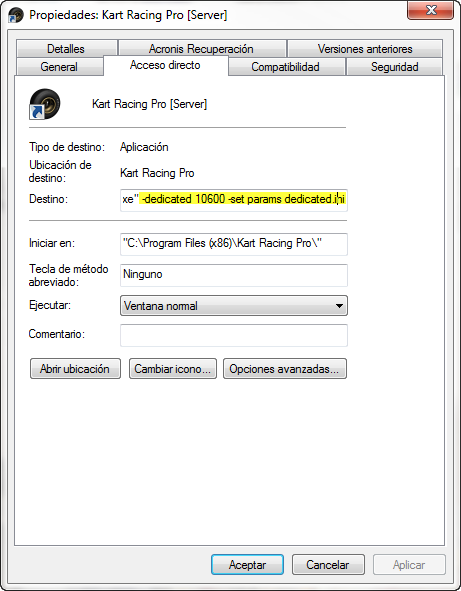 KartRacingPro-DedicatedServer where I put the parameters? Hi all, my name is Tomy. 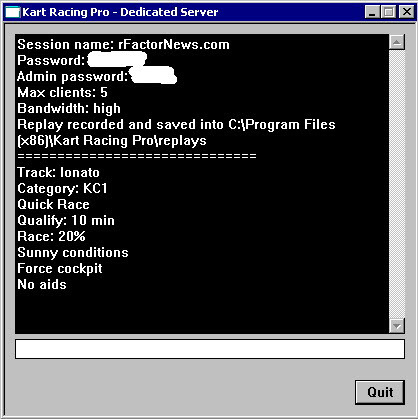 I'm www.rFactorNews.com administrator, one of the greatest comunities of simracing in Spain. First of all like to congratulate the author of this game because after buy and test it thoroughly during the day I found one of the best simulators currently on the market, but I will try to present here some questions on how to create an online server, because it has been a little complicated for me. But my colleagues who also purchased the game can't see the server, what am I doing wrong? 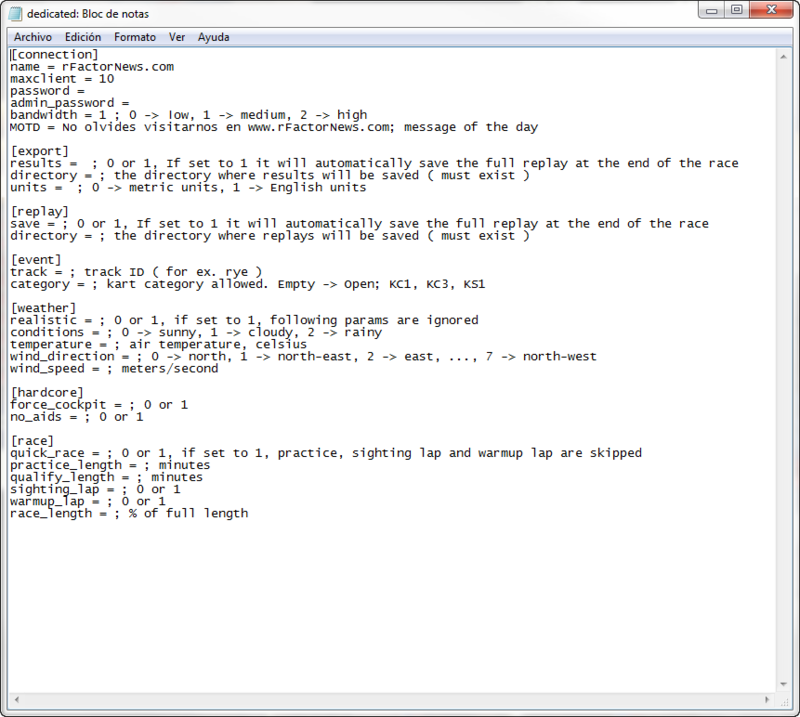 Please try setting race parameters. Today, suddenly and without doing anything before the server goes down and closes when I accept the error. The server is giving me these errors all time (about 20 minutes of running), what could it be? but in the server i have 20 minutes of qualifing! I don't think it works right if it's set to 1.
i tried to start a server i have created the shortcut with parameters, the ini file in KRP folder, ports are open. But when click on this shortcut server starts but the parameters that i have set are not there all is wrong, and when i run the game and click on world it says: connection lost. when i open the Drivingitalia.net dedicated server i have the rolling start, but i don't want the rolling, i want the normal standing start! Help me please. By the way, where are the new asphalt grip options?